MUFON is committed to good media relations to promote the study of UFOs. 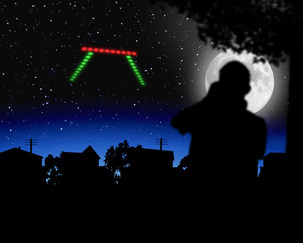 Please inquire about permissions and use agreements for MUFON content including original witness testimony, images, videos, maps, illustrations and statistics. Direct all inquiries to the email boxes below. Please browse our daily UFO Traffic Report. The Communications staff additionally syncs daily with dozens of MUFON scientists, researchers and Field Investigators with our ear to the ground. If something's happening - we're reporting it here. MUFON does not charge the news media for providing case-related news and related materials. In any project, charges will be mutually agreed upon for merchandise, shipping, office supplies or other required production elements. Request for-profit project rates for all media. MUFON may impose basic research fees for larger feature projects. Please inquire. Joshua resident Kerry Snell reported seeing a UFO near this area in Cleburne. Ron Baselice/Staff Photographer, The Dallas Morning News. We can provide Information on particular cases with related research and data in a timely manner to meet your deadlines. Statistics are available in many packages including total cases by country, state or town - or nationally by year and can be broken down into Resolved or Unknown cases. Inquiries might then be focused on shape, altitude, proximity to the witness or other case variables. Witness availability for print, audio or video interviews is welcomed, but not guaranteed. Each witness identify is protected, but we will contact witnesses on your behalf and convey your request. If you wish to be alerted to UFO activity in a particular area or region, please allow us to set that up. Recent news media reports below. USA Today, Top 10 states with the most UFO sightings, by Mary Bowerman, January 19, 2015. Wired magazine, If You Find Alien Life, Do You Have to Report It to the Government? by Christoph Niemann, September 9, 2014. 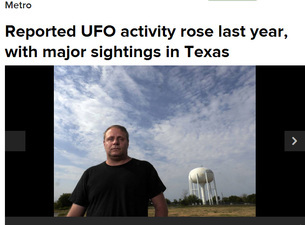 The Dallas Morning News, Reported UFO activity rose last year, with major sightings in Texas, by James Ragland, September 22, 2013. Milwaukee Journal Sentinel, Hartford adds UFO sightings to its small-town appeal, by Jim Stingl, August 31, 2013. For special projects or multi-episode formats, we will be glad to work with you in many capacities: Witness testimony, investigation notes and results as available, and other more demanding elements on-demand including coordinating assets for on-site production. CBS-Buffalo, UFO Investigations in Western New York, three-part series by Luke Moretti, July 14-16, 2015. 'Hangar 1: The UFO Files' is currently in its second season licensing case files from MUFON. MUFON is under contract with Go Go Luckey Productions for the History channel television show, "Hangar 1: The UFO Files," which just ended its second season. 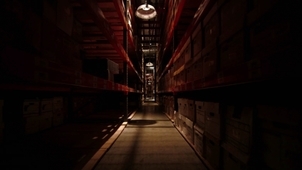 In some instances, we can collaborate on an individual case and provide full Archive cooperation. We would not be able to assist during this contract period with multiple requests for case assistance where more than one case appears in any single episode. Please feel free to discuss options and future needs for your project. We are currently negotiating for a third season with a December 2015 deadline. Current and recent television projects below. History channel, Hangar 1: The UFO Files, Season 1, 2014; Season 2, 2015. Destination America, Mysteries & Monsters In America, Who Are the Men in Black and What Is Their Connection To Aliens From Outer Space? Season 2015. With Journal columnist Nick Redfern and MUFON's Director of Communications Roger Marsh. Please inquire about permissions, rights and use agreements for all MUFON case assets including witness testimony, case investigation notes and conclusions, and related evidence, photos, videos, maps or illustrations. Current and recent projects below. 701: The Movie, directed by James Fox, written by Tracey Torme, produced by Tony Cataldo, Ines Romero, Tobias McGriff, upcoming release in 2016. 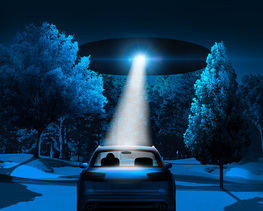 Cross Country UFO Witness Testimony, by Roger Marsh, a radio-style stage play presented at the MUFON 2015 Symposium, September 25, 2015, Hotel Irvine, Irvine, CA. Travis: The True Story of Travis Walton, a film by Jennifer W. Stein, 2015 release.